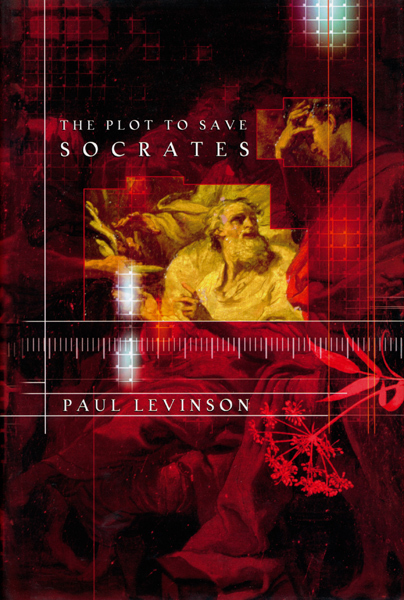 One of the most deliriously mind-boggling time travel stories I've read, Paul Levinson's The Plot to Save Socrates is a rare example of a novel actually thriving on paradoxes and confusion. The less the book seems to make sense, the more intriguing it gets. It's like working your way through a maze, with numerous confounding switchbacks and blind alleys. That its convoluted structure ultimately boggles even Levinson, leading to an ending with important story issues still unresolved, is perhaps inevitable. But it's exciting to see a book as daring with both its ideas and its approach to narrative structure as this one hit the shelves. 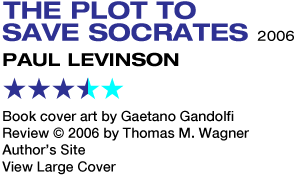 And as the title might indicate, Levinson also hopes to make philosophy geeks squee. Whether they do or not will be up to how receptive they are to seeing history's most famous septuagenarian intellectual martyr participating in a climactic fight scene. The story's premise is rooted, as you might have surmised, in the death of Socrates, who, according to his student Plato, was sentenced to drink hemlock by the democratic government of Athens for corrupting the morals of Athenian youth with his teachings — particularly those teachings deriding Athenian democracy as mob rule. In the dialogue Crito, Socrates rejects an opportunity to escape his imprisonment and death (which would have apparently been really easy) by arguing that he was only ever justified in criticizing the Athenian government by first accepting its authority. To reject his sentence would be not only cowardly, but would place himself above the state. Even if the individual finds the state corrupt, the state has made it possible for that individual to live in the first place, by educating him, providing him with sustenance and work opportunities, even enabling him to be born by sanctioning his parents' marriage. People are free to accept the state's authority or find somewhere else to live (a concept not exactly put into practice by most of the totalitarian regimes said to have been inspired by Socrates' and Plato's political theories). Historian I.F. Stone argues that this stance was more or less bluster, and that what Socrates really wanted was for his unjust execution to shame the Athenian government in the eyes of the world for all time. Which seems to presuppose a lot about Socrates' confidence that he'd be remembered forever. Whatever really happened with the death of Socrates, the event has inspired this yummy little pretzel of a story. It opens in 2042. Sierra Waters, a young Manhattanite pursuing her doctorate in the classics, is presented with an extraordinary document by her prof and mentor, Thomas O'Leary. It's a heretofore undiscovered Socratic dialogue, which Thomas guarantees her is no forgery, allegedly relating an encounter on the night of the philosopher's death following his exchange with Crito. In this dialogue, Socrates is once again petitioned to escape by someone called Andros. The interesting part is that Andros claims to be from the distant future, and even suggests cloning a duplicate body for Socrates so his jailors will be none the wiser. The remainder of the story defies easy synopsis, but its basic narrative mysteries are these: Who was Andros? Did he in fact save Socrates? And what was his purpose? Without giving too many of the best surprises away, it's safe to say that the narrative is propelled back and forth through the centuries — to late 19th century New York, where William Appleton, Darwin's American publisher, gets in on the fun; to the library in Alexandria; all the way back to Socrates' fateful night in 399 BCE; then back to the future again. Levinson, since he doesn't have to, doesn't bother with linear narrative. This actually proves the novel's most inspired quality. We often meet new characters without realizing we've met them before. Effects are shown before their causes. Everyone obsesses over the dilemma of time paradoxes, doing something that could unravel the future as we know it. Yet all of the characters' motives are focused on the same set of goals: solving the mystery of Andros and saving Socrates from the hemlock. It's an absolute treat to sit back and be wrapped up in a story that gives a retro SF premise like time travel such a brilliant new kick, and it's doubly delightful to find the story as fun and entertaining as it is thought-provoking. Brain candy and brain vegetables, all in one serving. The story does lose itself a bit at the climax. Since I really think everyone should read this, I'll try not to spoil things. I'll put it this way. Some readers, particularly those well-versed in their philosophy and history, may have a problem with how the final scene in Socrates' cell plays out, particularly given Socrates' recorded views in Crito. (It seems a little abrupt and out of character to me.) Also, there's one character who is set up as a villain, and yet his motives are confusing and never satisfyingly explained. After all, he wants pretty much what the protagonists want, and for reasons that don't seem to warrant much of how he actually behaves in the story. And at the tail end, he disappears from stage without any resolution. For any other book, such shortcomings would likely lead to a harsher final analysis and lower rating than I'm settling on here. 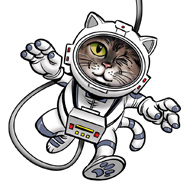 But I was sufficiently impressed by the wealth of imagination and willingness to defy convention that Levinson displays that I can recommend the book to any and every SF reader looking for something original for a change. And if, like a good Socratic dialogue, it gets people arguing into the wee hours of the morning, so much the better.